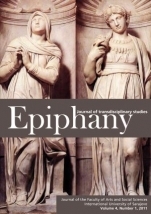 Epiphany is an online-only, semiannual journal dedicated to promoting transdisciplinary studies, across the subject areas of anthropology, cultural studies, economics, history, literature, media studies, philosophy, psychology, sociology, technology, and the visual and performing arts. The journal’s stated intent is to promote a holistic approach to the humanities and social sciences. Articles are in English, and thus far most of the content is about English literature -- the premier issue in 2008 included the articles: “The Concept of God in Beowulf and The Book of Dede Korkut” by Hulya Tafli; “Romance in Peril: A Survey of the Genre in Seventeenth Century English Literature” by Mustafa Bal; “Religion and Identity in Joyce’s A Portrait of the Artist as a Young Man” by Catherine Akca; “Humour in Prison: Brendan Behan Confesses” by Enrico Terrinoni; and “From Coolie Hinterland to Babu Stardom: An Interview with Tabish Khair” by Nilanshu Kumar Agarwal. Subsequent issues contain 14 articles about English literature, 2 in political science, and 1 in psychology, along with several poems – which does not appear to be very transdisciplinary. However, the most recent issue, Volume 4, Number 1 (2011), includes articles on media, politics, religion, feminist studies, sociology, cultural studies, and poetry, as well as a book review of Prilozi za istraživanje sociokulturnog položaja žene u BiH: Izabrana Bibliografija (1900-2010) / Supplements for Research on the Socio-Cultural Status of Women in BiH: Selected Bibliography (1900-2010), so progress seems to have been made in a multidisciplinary direction. All authors listed in the 2011 issue are on the faculty or are graduate students at the International University of Sarajevo, which is not surprising given that the University publishes the journal. The quality of the English translation varies somewhat (the home page states that, “Epiphany is a be-annual publication”), but the articles display sound research and scholarship. The journal offers its own rudimentary search system that allows for broad content searching as well as searching by access points (title, author, etc.). The journal does afford an inside look at scholarship in Bosnia-Herzegovina, and researchers working in regional and cultural studies will want to be aware of this title, especially since it looks like the content is getting stronger and more varied.